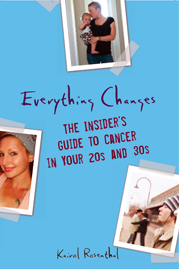 Everything Changes – The Guide to Young Adult Cancer » Mourning As A Young Adult? What a perfect blog post for me today. I know that the passing of one’s parents is different than the passing of a husband, yet I understand the mourning and grief very well. Everything goes on, but without the loved one. I find it tough at any age. Eventhough I was 35 when my father died and 41 when my mother died,grief is a process, a long process and noone has a right to tell you when and how to grieve because it is a very personal experience with every single person. Thanks for a great post, much love to both of you. Beautiful post Charissa – and thank you for sharing this Kairol. I lost my partner of 2 years, Jason, a little more than 3 months ago. He had Burkitt’s Lymphoma (non-hodgkins) and died exactly 1 year to the day of his diagnosis. Weird, I know. The weeks since his death have been indescribable. I’m 29 years old, and most of my friends are worrying about getting married or starting a family. I was surrounded by people in the days after his death, but I’ve never felt more estranged or alone. No one around me knew what to say, how to act, and hell, neither did I for that matter. I would get angry at things people would say. I even got mad things I said. There were times I just wanted to enter the “Widow(er) Relocation Program” and re-emerge 6 months or a year later when everyone around me had forgotten what happened. There were people who tried to “help” me along. I say “help” because for some (my jewish mother) it was more of a shove. To her (and the few others) I finally had to stand up and announce that *I* am in control of how *I* will deal with this. It was a completely liberating experience. Once I stopped searching for rules and I stopped trying to appease everyone else’s thoughts on how I should act, I was able to focus on MY needs and feelings. Once I started listening to my heart, I realized what I needed to do for myself in order to move forward. For me, that’s when I truly started to heal. I think each person is different in how they’ll handle this situation when faced with it. While I agree, there are no general rules on how to do this, I do believe there is 1 important thing to remember: Let yourself feel it. Let yourself hurt. Only YOU will know when it’s time to begin to heal. NO ONE else can tell you what to do. Wow- Stuart, thank you so much for your post. I am so very sorry for your loss. I know how you feel, when you talk about being surrounded by people but feeling completely alone. People try to relate their own experience with loss (parents, grandparents, goldfish) to yours, and as much as you can appreciate the similarities, its so much different dealing with the loss of a family member you were born with than a family member and partner who CHOSE you. It creates a nearly indescribable void. One that, fortunately, not many people can realte to. No, there are no rules, per se. I was 13 when I lost my first loved one to cancer; by 33 both parents had died of cancer, at 43 I had my own, at 50, that of my partner. At 52, a recurrence of his cancer. I always remember this: I am not alone. It felt like I was many, many times, but I remember that reality indicated otherwise. I hope you will eventually connect with others who have lost a beloved partner. Please remember that there are many of us out here who wish you well, wish we could do more, and support you in thought and prayer. Of course, this resonates with me & I appreciate you both, Charissa & Kairol, for sharing about this topic again. I’ve also found that there are no set rules for grief, and I am a details person—-one who likes a plan. That’s what I did all through Mike’s diagnosis with HD and over eleven years of constant treatment, but reading & research & planning went out the window after Mike died. Rules & order didn’t feel right and I was lucky enough to listen to myself and not force it. I tried to be open to what life had to offer me, and be thankful I was still alive no matter how much I was mourning & missing Mike. What also helped was having family & friends who supported me in doing whatever it was that I needed to do during the process. As a result of being out in the world, living & not holding back my & Mike’s story, I met two men who had lost their spouses to cancer around the time Mike died. Each of our experiences were different but we quickly bonded. Through these two friendships, I was able to see how each of us was dealing with it individually and we’ve become wonderful confidants with a “widow/er shorthand” of communicating. There is no “right” way or “ideal” pace of moving through mourning, but there is a way and, no matter how many stops-n-starts or loops & dips, it is the “only” way for you. It seems to me that sometimes the hardest and most important parts of life are often considered too uncomfortable to talk about. And many are left to do the most difficult parts of life in varying swells of isolation. Thanks yall for giving words where there could be just silence…. There are now camps for kids who have experienced a close loss. I think it would be nice to see more peer support events for young adults. As a former peds onc and peds hospice nurse, it would be nice to see something for that too. Kairol, I’m not sure that Kubler:Ross stages of grief are ‘rules’ as much as observations. The thing about making them rules is that planner-types think they have to feel all of them, and in order — and as everyone agrees, there are just no rule to grief and loss. Where K:R is accurate is that, acknowledge them or be aware of them all or not, each of us does (usually) experience most of the described stages. Many people aren’t willing to admit they’re in denial, or they’re angry, or even that they’ve reached some form of acceptance — after all, that would be following ‘rules’ or admitting that they (we) are just like everyone else. I also have to agree that while grief is different to some extent depending on everyone’s individual experience and the thing over which you’re grieving, grief is ageless. The sense of loss is still a sense of loss — whether you’re a young adult who’s lost a spouse, or an older adult who’s lost a spouse. And regardless of age, you will always be surrounded by others with whom you feel out-of-sync. Great post Charissa. I was 25 when I lost my husband a month before our 2nd wedding anniversary. He and his brother were killed in a car accident. 7 years later I was diagnosed with breast cancer and figured it had to be joke! In what twisted universe could that happen. But I can say that losing my husband in alot of ways for me was worse than going through cancer myself. And somehow knowing that I had survived the loss of my husband was fuel for me to make it through cancer treatment. I felt very isolated as a young widow, hated the term, felt it was reserved for old women who had spent a lifetime with their spouse. I didn’t know anyone else my age who had been through it. My parents didn’t know what to do with me. They were divorced at the time and could pretty much only relate to my in laws regarding the loss of a child. They literally said to me that what his parents were going through was harder than what I was going through because losing a child was the worst thing that can happen. Of course I don’t doubt how awful that loss must be but it would have been nice had my parents been able to acknowledge my feelings and support me through the loss I was experiencing. Suffice it to say I was alone in more ways than one. That was 15 years ago….this saturday the 5th is the anniversary. Not one day in all those years has gone by that he hasn’t crossed my mind. I have been remarried for 6 years now and it seems as though that time in my life was lifetimes ago and yet it feels like yesterday. I agree that there is no right or wrong way to get through it. No rules! I think you have to just handle it the best way you can and not get caught up in all the advice that others will throw your way. Unless of course they have been there! People may treat you different or walk out of your life which was my case but it is certainly a time when you find out who your true friends are. Honor your feelings as well as your loss and do the best you can to move forward. The Kubler-Ross stages are stages but they don’t neccessarily happen in order and the acceptance part I think for me may never happen. The other stages come in waves, and all of the senses have a part in your grief too. Still it is nice to have names given to stages of grief but it is not all there is to grief it is more expansive than that. Once again, a great topic and thanks to you and Charrissa for sharing your journeys with us. This is a good conversation and is spurring on the theme for a new post about stages of grief and coping. I’m curious if any of you who are mourning have circumvented any of these stages? I know that I never had denial about have cancer. I’m curious to know if others felt they immediately had acceptance or never had denial around the loss of a partner? When I met Rick I knew this day would come, so I suppose I accepted it long before it ever happened. I accepted it when I decided to pursue a relationship with a person who had narrowly escaped death many times before. I made a conscious decision to be in a relationship with a person I knew I would outlive. Maybe that sounds weird. Of course I hate that it happened, and was shocked when it did, but he had a lengthy history with illness and I knew that going into it. I think that makes a huge difference, as opposed to when youre already in a relationship with a person THEN they get a diagnosis. Maybe not. Because we had a group of mutual friends, I ever knew about his health before I ever MET him. Im not necessarily super familiar with how “denial” is defined in the stages, but I honestly dont think Ive ever been in denial about his passing. I’m with Charissa on this one. Jason’s case came up a year after we met and got together. Obviously, it was something neither of us was expecting, but we never went through the “stages” when it came to his diagnosis. We just accepted it and did what was needed. We were told Jason wouldn’t make it on March 20th. That’s the day we found out the cancer had exploded all over his body. The doctor gave him 2 months. Doc was off by 1 week. In that two month time period, though, I still don’t recall us ever going through the grief stages, per se. There was shock, of course, at the beginning, but in the two months that followed we never denied what was happening. We spent the time preparing – getting paperwork in order, setting up hospice, taking care of bills, and spending time together with friends and family. Everyone accepted it before it happened. No one liked it, but we all accepted it. There was no denial, no depression, no bargaining. The only two I can see that we ever experienced was anger (who wouldn’t be pissed that this was happening to them) and acceptance. As for denial….I don’t know if this classifies as such but after my husband died I would still listen for his car outside around the time he would come home from work and sit at the door expecting it to open any minute. We both worked at the same hospital and would pass each other in the hallways and call during the day. I found myself seeing him sometimes (most likely someone who looked like him) walking down the hall. And then I would pick up the phone to dial his extension and start to cry the second I realized that he wasn’t here anymore. Because my husband’s death was a car accident, no illness, a healthy person, it came a an unbelievable shock. No preparation, no goodbyes, that I think in my shock after the accident all of these things could have been part of that. So not sure if it was denial but that was how I experienced it for at least the first 6 months after the accident. One of the b!tch things about dealing with death and dying is that (typically) EVERYone outside of the death thinks their own path through this is hardest. I’ve known several parents who give/gave losing a kid worst-case-scenario status…but none of them have ever lost a spouse, and all of them have living parents. When I’m in a black mood, I wonder how they’d ‘rank’ the losses if, goddess forbid, they had a terminal kid, parent and spouse. It’s the old ‘who do you throw out of the lifeboat?’ question, in real time. I’ve also heard many times from all sorts of cancer patients that they think their illness and pending death is tougher on their caregivers. And I admit that since I’ve been surrounded for the last 5+ years by a mix of family and friends, that simply doesn’t resonate with me. But there aren’t a lot of cancer patients who will say this out loud. My friends and co-workers, some who have been more my caregivers than my family, never ever responded that way, and for that I was more grateful than I can really ever express. Why? Because ‘this cancer hurts me more than it hurts you’ is a horrendous burden to lay on someone who’s already dying. To be honest, while I got angry about having cancer, I got *more* angry that some of my relatives were turning my impending demise into a who’s-gonna-hurt-the-most contest. OMG! Once they found out I probably only had 18 months to live, you’d have thought I was their personal candidate for sister or daughter of the year. Whether it was a right feeling or a wrong one, I couldn’t help thinking “geez, *I’m* the one who’s going to die here.” It wasn’t that I didn’t and don’t acknowledge that a caregiver/partner’s road is very difficult. I was a live-in caregiver to my grandmother for several years as she deteriorated with dementia. I watched her change from a self-sufficient woman who lived alone in a tough neighborhood to someone who couldn’t take care of herself in even the simplest ways. I could do nothing to make it easier for her, fix it, change things. Those 5 years were horrendous. But I learned from that experience that a caregiver/partner’s road, while very difficult, is an evolving path. It’s flexible. The destination isn’t permanent in the same way that the illness changing the patient makes the patient’s destination permanent. When the life-changing event(s) happen to the patient, the caregiver/partner still has options going forward — but the patient’s forward motion is, sooner or later, going to end. As you can imagine, that doesn’t usually go over well with caregivers or partners. But it’s a patient’s perspective, and like we’ve said ‘there are no rules’ to this. i think its really important for everyone to remember that no ones situation is more awful or difficult than anothers. what was so powerful to me, and what i hoped to convey in my original message, was simply that it took someone telling me that its ok to feel however you feel, for me to realize that was true. Just wanted to say to Pat…strong comments! Thanks for sharing all of that. And Charissa, I so agree with you that “no one situation is more difficult than anothers” That for that person no matter what the loss it is their “worst” thing that could happen for them at a given point in time…I think sometimes we just want those around us to acknowledge our feelings. Hi. I’m a little late to the conversation, I know, but all of your posts touched me so strongly, I thought I would post. I lost my husband of 5 years to kidney cancer on March 21st. He was diagnosed 2-1/2 years earlier, so we had plenty of time to “accept” the diagnosis and at some level, we did. We talked a lot about our hopes and dreams for our kids (age 4 and 2 at the time of his death) and took steps/made decisions that would help advance my career (sometimes at the expense of his own), etc., etc. But we never stopped hoping and researching new treatments (he would have done anything to have more time with us, to see his kids reach that next big “milestone”), and we never stopped living (he was a very hands-on and devoted dad and husband, who was able to take them to the park and play with them even while undergoing treatment). So when his oncologist reported that the cancer had “exploded” throughout his body and that he had only about a month to live, we were still unbelievably shocked. Again, though, we accepted it in the sense that someone else above described: we got our affairs in order, managed his care through Hospice, talked about plans for the future and finances, spent as much time as a family as we could, made videos, wrote letters to the kids, and on and on. But at some level I have still not really accepted it. My whole body recoils when I have to check the “widow” box on the kids’ school financial aid applications–and on most other applications, I continue to check “married” because that’s what I consider myself. When a well-meaning co-worker remarked on how much I was juggling as a “single mom”, my blood boiled–and still does. I don’t know that this is denial, or just that I think these labels do not do his life justice and I like to believe that he is always and will always be with me. I do also, like someone posted above, feel a very strong urge to pick up my family and move to the middle of nowhere. Re: there being no rules for this, I must try to keep this always in the back of my mind. I have a wonderful support network of friends that have been there for our family from the day of my husband’s diagnosis, but I do often get the sense now that they expect me to be healing, to be more able to do things like go to birthday parties or other gatherings where there are mainly whole families. It is in moments like this where I am reminded of what we “should have had” that the hurt is the rawest, and it’s hard to explain to my friends. I will try to remember there are no rules and that I need to let myself do what feels right. Thank you a ton for this blog, Kairol, and this post, Charissa. I am obviously so sorry that there are other young people out there that are going through a cancer diagnosis or the diagnosis or someone they love, but I guess I’m glad to know I’m not as alone as I thought. There are not many resources out there for younger people going through this and I feel many of our needs and issues and concerns are so different. This may not qualify, as I became a widow at 45, so what I consider young may not be your definition. There are some similarities to these stories. My husband and I were both diagnosed with cancer 10 days apart and went thru our surgeries and recuperation together. It was a terrifyingly unique time but also nearly transparent in our unity of facing our futures. Although together for 10 years, we’d only been married for 1, and the night after our 1st and only anniversary, I had my surgery, 2 days later he had his. He passed about a month later, leaving me shattered. Days after burying him I started my treatment, not really caring much about the outcome. So on the which is worse, having cancer or loving/caring for someone with cancer, I can only say that for me, it’s much worse to have the person you love have cancer, as you feel out of control. Your own cancer you can handle somehow. My friends kept asking me how I was doing, and I never considered what they really meant, which was how is my cancer, because all I could feel was my grief. I am now able to say that our love has continued, and I have not put my husband into the past tense box that society wants you to accept, and that his absence, so deep and hurtful at first, is more a presence now, although a melancholy one at times. Those who cannot transform their pain end up passing it on to others, and after some time now, I don’t miss him any less, but I have more joy in having shared his life, than the constant ache of grief. I wish this for all who lose their spouse/partner.